The Museum is participating in Open House New York, America’s largest architecture and design event. 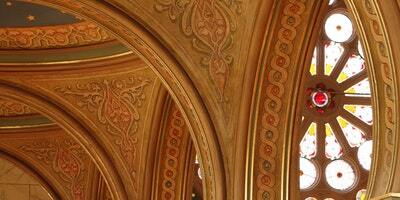 Join us for free synagogue tours that tell the story of our home, the 1887 Eldridge Street Synagogue. This magnificent landmark is the first great house of worship built in America by Jewish immigrants from Eastern Europe. We offer tours at 10, 11, 1, 2, 3, 4 and 5 pm. At noon join Hanna Griff-Sleven, a folklorist and the Museum’s program director, for a special tour on the design, traditions and folklore of the Eldridge Street Synagogue. Families can take part in our self-guided scavenger hunt and rose window art activity from 1 to 3 pm.